The Learning with MOOCs III conference was announced. It will be held on October 6–7, 2016, at the University of Pennsylvania. The MOOC field continues to expand rapidly. Coursera announced at its Partners Conference last week that it has reached 18 million learners and 3.6+ million course completions. Meanwhile, Spanish MOOC platform Miriada X has reached two million students. The University Of Michigan plans to launch at least 200 MOOCs by 2017, and its business school has reached more than one million enrollments. The University of Pennsylvania’s Wharton School is close to reaching three million enrollments. The number of South Korean MOOCs is expected to surpass 100 this year. In financial news, Udemy announced it will simplify its prices to $20–$50. 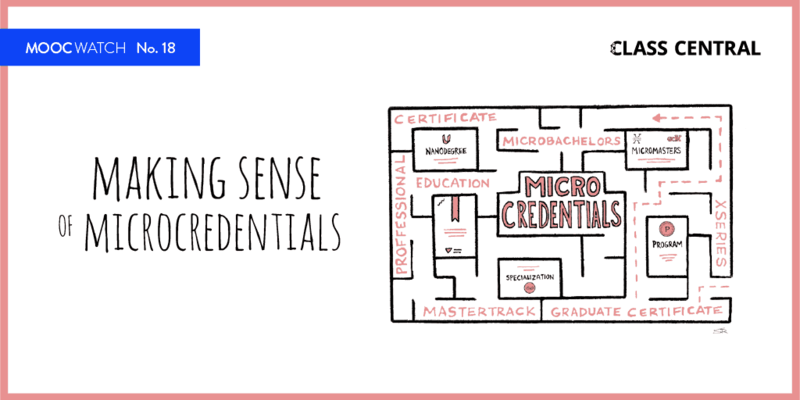 We have documented a number of ways to get credit for taking MOOCs. We’ve also developed a Twitter-like Follow button so you can follow your favorite MOOC subjects. All that said, a new survey has found that (so far) only 18% of adults are familiar with MOOCs. Impressive numbers at #CourseraNL strategy track : 18M learners, 40% female, 3.6+M course completions, 17K+ years of video watched ! 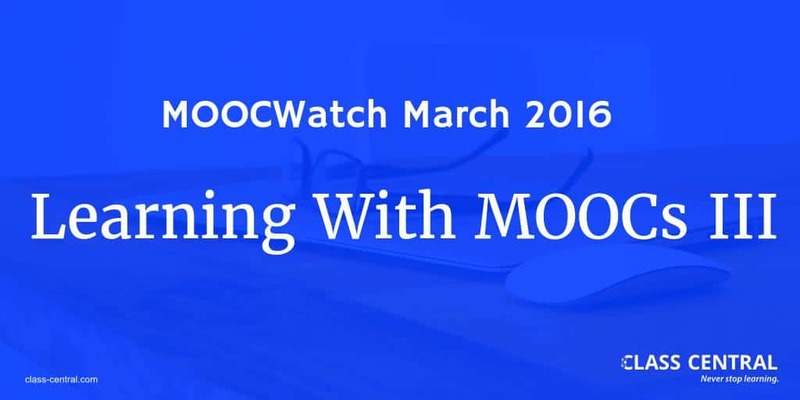 We created a list of all the ways you can receive academic credit for completing MOOCs. A new survey from the Pew Research Center finds that (so far) only 18% of adults in the U.S. are familiar with MOOCs. Udemy decided that all courses will be priced from $20–$50 each starting on April 4. Udemy analyzed lots of data on the prices of courses purchased by its ten million students. The best new courses starting in March 2016. MOOC instructors at the University of Michigan and at IIM Bangalore talk about their experiences so far. 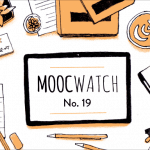 This month there were two great articles with helpful tips to consider when designing MOOCs. A list of 550+ free online courses starting in March 2016. The list of 169 new courses added to Class Central in February 2016. Study analyzing HarvardX MOOCs’ course structure (the type, frequency, and grading of various activities in a course). In-depth look at the current state and needs of arts MOOCs, and a look at them in comparison to MOOCs in other subjects. New Stanford/Vanderbilt study on what factors contribute to student persistence and engagement in MOOCs. We couldn’t figure out whether the MOOCs in the study were self-paced or session-based. OpenClassrooms founder Mathieu Nebra describes Benjamin Bloom’s breakthrough discovery in education from the 1980s, and then looks at why it wasn’t possible to scale the methods — until now. Enrollments in non-MOOC credit-based courses reach 65,428 at the University of Iowa. Iowa residents’ enrollment in non-MOOC non-credit courses reached 599,552. 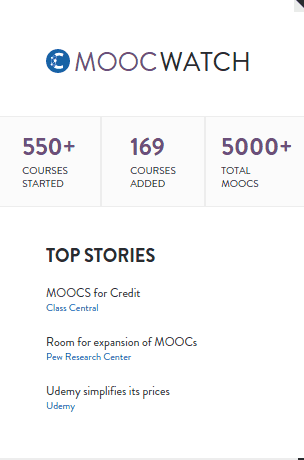 There are now more than 5000 MOOCS from 600 universities around the world (with 550+ courses starting in March 2016) on the Class Central website. Class Central has developed a Twitter-like Follow button that enables you to follow universities, subjects, and course providers. Great article describing the experience (and results) of a MOOC instructor flipping his on-campus class. Online courses are starting to be made available during flights and in prisons. Kyoto University’s MOOC on human evolution and primatology held a competition for learners to win a trip to Japan with all expenses paid. Class Central is great for MOOCs . But I would like to emphesize that the important matter is solution to HE in USA + in the World . It is very easy with good online by good colleges and universities . Both must be good . Online course + college . I am asking the best 200 colleges in the USA ( Look up US News Rankings ) to provide 50 % courses for a degree online + 50 % f2f . Then tuition is 560 % reduced + capacity of the school doubled + quality of the JHE in the USA go up more than 50 % . 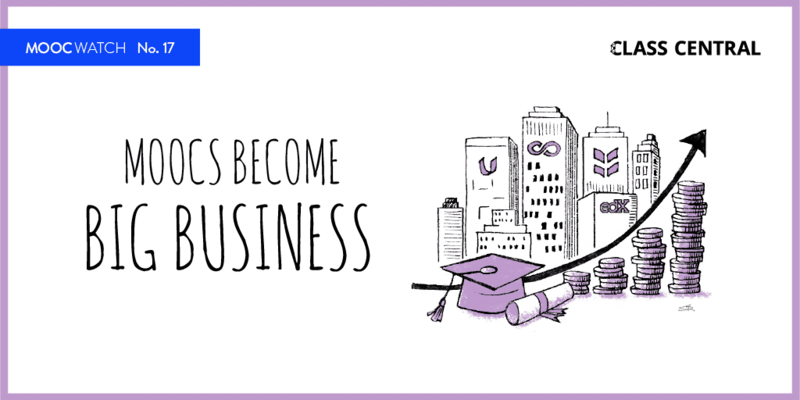 In the past 20 years online was provided by vbery bad colleges at high prices therefore online does not have a good reputation . Now online by top universities are in . Let us convince these 200 colleges to provide 50 % online courses for a degree . Look up MIT model. Supply Chain MS program . 50 % online + 50 % f2f . Cost is 50 % reduced . 1.- So far how many courses were offerred ? 2.- 18 million registered, but how many completed the course and get a certificate ? 3.- Now many short courses too, 2-3 weeks . So we have to count only 10 weeks or 15 weeks courses . 4.- We have to increase for credit courses very rapidly . Thanks for your comments, Muvaffak! 3.6 million course completions on Coursera (so far). That means about 18% completion rate. I know very well average completion rate is at most 5-6% . Please check your numbers . I highly “advocate online by reputable colleges . 18 million is not the number of course enrollments but the number of students. Totally course enrollments (so far) are probably much higher.